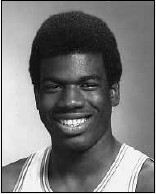 Drafted: Selected by the New York Nets in the first round (7th pick overall) of 1977 NBA Draft. Man, this dude was cold blooded. The 25.8 ppg. Div. 1 average is something to shout about, but check out that field goal percentage, rebounding, and free throw averages. Funny thing, I don't remember much hype about him during high school, certainly nothing like his younger brother (Albert) received from Sports Illustrated when playing for Brooklyn (NY) Fort Hamilton a few years later. Of course, I remember even less said about Dr. J during my era (1967), and we all saw the damage he did.There's often little or no relationship between the hype the quality of the player.